A co-moving clump of stars was found in the constellation of Draco at a distance of approximately 8,500 light years away by a team of astronomers from the Chinese Academy of Sciences. It is assumed that the newly detected stellar group is a disrupted globular cluster, according to the researchers. They described their discovery in a paper published online on Dec. 16 on the arXiv pre-print server. Using the data from the Large Sky Area Multi-Object Fibre Spectroscopic Telescope (LAMOST) at the Xinglong Station observatory in China, the scientists were able to derive important information about the cluster such as its distance, age, mass, luminosity, velocity and orbit. They used about 2.5 million stellar spectra available in the second data release of the LAMOST spectroscopic survey, searching through the spectroscopic dataset and looking for metallicity-velocity clumping inconsistent with the field. John Jason Vickers, who is the lead author of the study along with the co-authors, estimates that this cluster, named Lamost 1, has a total mass of about 25,000 solar masses and has luminosity approximately 15,000 times greater than our sun. The researchers are 90 percent sure that the stellar group is about 11 million years old. When studying Lamost 1's characteristics, the scientists have also found that it could be a part of a larger structure. "The large physical size and the fact that the tangential velocity dispersion is so much higher than the radial velocity dispersion imply that this could be part of a tidal stream, although some tangential velocity dispersion is certainly an effect of proper motion uncertainty at this distance," the paper reads. By knowing the velocity and position of the Lamost 1, the researches can tell that this clump is near a point in the orbit at which it is furthest from the center of its galaxy. However, there are doubts over whether Lamost 1 is really a disrupted globular cluster. The high metallicity indicates that there is possibility that the studied group is a large dwarf galaxy progenitor. On the other hand, the lack of a strong physical overdensity speaks against this hypothesis. 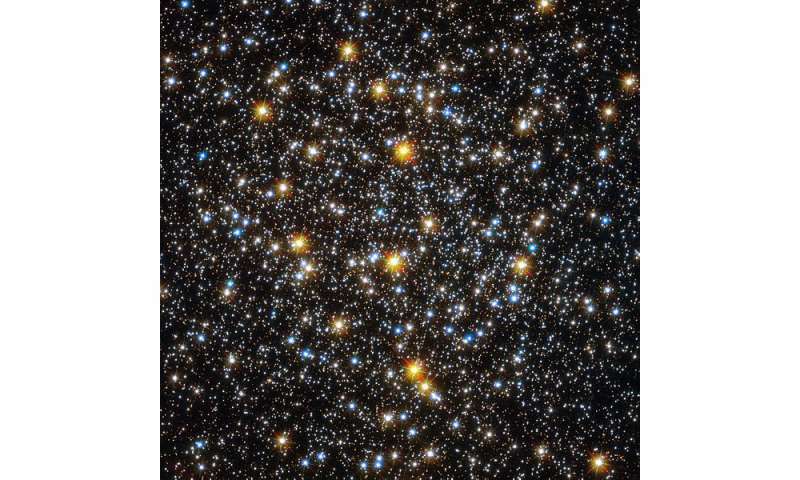 "The stream's progenitor could be either a dwarf galaxy or a star cluster. The high metallicity of our stream implies that if the progenitor were a dwarf galaxy, it should be relatively massive, on par with that of the Sagittarius Dwarf. Since we do not see any prominent physical streams in the photometric data, we look to another possible explanation," the astronomers noted in the paper. The elliptical orbit and advanced age of the clump supports the globular cluster origin theory. It was more likely a spherical collection of stars orbiting a galactic core once. "We postulate that this object is a star cluster being observed near the apocenter of its eccentric orbit. It manifests as a signature distinct from the background in velocity and metallicity space," the scientists wrote. They conclude that the object of interest is likely to be a nearby, intermediate-age globular cluster which is being disrupted by the galactic potential. According to them, the spectroscopic technique provided by the LAMOST telescope could help uncover numerous known objects and structures, as well as more puzzling, unknown features like Lamost 1. Can super-fast stars unveil dark matter's secrets? The reported age of the object is 11 billion, not 11 million years.